It is opening week for the 2017 high school football season in Florida. That means lots of things are going on around the state to open the season. 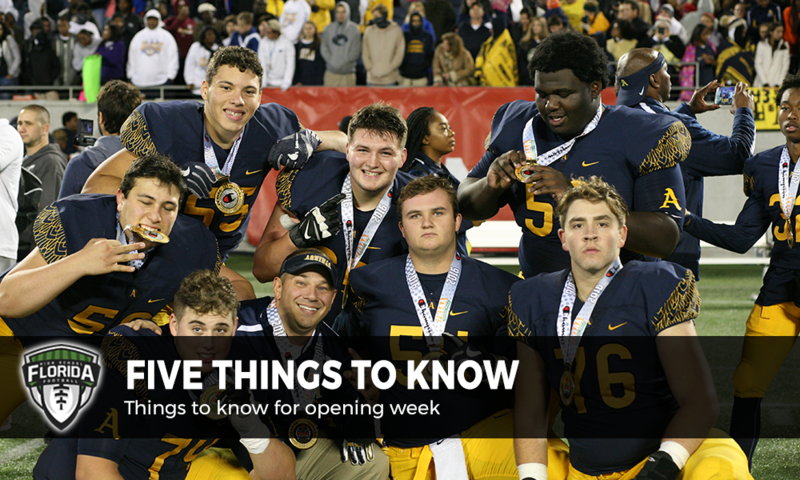 Here are five things to know as the season gets underway. For the first time since the 1974-75 season, every game in Florida is going to matter this season for teams in all eight classifications with the official launch of the new FHSAA Playoff Points system. That means Week 1 is going to matter now as much as Week 11. Using a system modeled after Nebraska’s playoff points system, each game will earn points based upon the end of the season record of every team’s opponents during the season. Teams who scheduled an FHSAA playoff team or against a team from an out-of-state equivalent association from 2015 or 2016 gained three (3) additional bonus points which the FHSAA has calculated in their master schedules. The biggest thing for this week though is to watch how close a lot of the Week 1 matchups are on the Scoreboard. This will be a telling sign for the rest of the season in how close we could expect to see matchups given the level of scheduling that we have not seen in years in Florida during the offseason. The FHSAA will start issuing points system updates around Week 5, but will not give us what the picture might look until after Week 8 or Week 9. Nearly two dozen games involving teams playing an opponent from out-of-state are on the schedule for Week 1, including several that will be nationally televised. Of the out-of-state matchups on the schedule this week, the most talked about one is the matchup is the one between USA TODAY Super 25 teams No. 3 St. John Bosco and No. 5 St. Thomas Aquinas. St. Thomas Aquinas is also ranked No. 1 in FloridaHSFootball.com’s Florida Top 25 rankings. That game air LIVE from Brian Piccolo Stadium Friday night starting at 7:00 p.m. Eastern on ESPNU. St. John Bosco was a national champion last season through several national ranking services and between them and St. Thomas Aquinas, both are potential candidates for a possible national championship this season. Another big-time game on the schedule includes Bartram Trail at Cartersville, Ga., which will air Saturday on ESPN2 starting at 7:30 p.m. Eastern. Cartersville is the defending GHSA AAAA state champion while Bartram Trail is coming off a 2016 season, having reached the regional finals and is among the teams expected to have a potential chance to emerge as the team in Class 7A North to play for a state championship in Orlando in December. Other big out-of-state games to watch out for include USA TODAY Super 25 No. 2 IMG Academy at Super 25 No. 7 Chandler, Ariz. which will air live at 10:30 p.m. on ESPNU, as well as Vero Beach at Oscar Smith, Va., Archbishop Wood vs. Oxbridge Academy at ESPN Wide World of Sports, American Heritage (Plantation) at Bishop Sullivan, Va., Venice at Camden County, Ga., Melbourne Central Catholic at Buford, Ga., Jones at St. John’s College, D.C., and Avon, Ohio vs. Merritt Island at ESPN Wide World of Sports. There is no shortage of top quality in-state matchups to kickoff Week One here in the Sunshine State. As mentioned earlier, the new FHSAA playoff points system for football has really made schedules much more interesting for the first time in many years and Week 1 has produced a plethora of top matchups. Starting on Thursday night, Traz Powell Stadium in Miami will host three straight matchups that will involve teams ranked in FloridaHSFootball.com’s Florida Top 25 rankings. The first one will come against No. 15. Chaminade-Madonna vs. No. 7 Miami Central on Thursday night. For, Friday and Saturday night will involve games as part of the first-ever Superintendent’s Cup which will matchup a team from Miami-Dade County with a team from Broward County. Those matchups include No. 10 Deerfield Beach vs. No. 3 Miami Carol City on Friday and No. 23 Cardinal Gibbons vs. No. 8 Miami Southridge on Saturday. Some other big-time matchups include a rivalry renewal with Lakeland traveling to Manatee which is the first meeting between the two teams in quite a while. Also, keep an eye on matchups involving Cocoa at Trinity Christian (Jacksonville), Armwood at Tampa Bay Tech, Raines at Robert E. Lee, Dwyer at Park Vista, Plant at Hillsborough, Osceola (Kissimmee) at Lake Gibson and Charlotte at Dunbar. COULD ROUGH STARTS IN THE PRESEASON MEAN TROUBLE? If you looked around at some of the scores from this past weekend’s preseason games, there were a few surprises to be found lurking around. First, Manatee laying a complete goose egg against Armwood on the road in head coach Yusuf Shakir’s debut as the head coach at Manatee, some are wondering if the Hurricanes will reach .500 this season. However, Shakir has a knack of getting his teams on track after slow starts. Just look at the times that happened at Lincoln in Tallahassee, but as the Bradenton Herald has told Hurricanes fans, they need temper the expectations for at least this season. Mainland was another team that seemed to have found trouble in the preseason in a road trip to Apopka. According, to the Daytona Beach News-Journal, the Buccaneers turned the ball over four times in the first half on six possessions, which is highly uncharacteristic for a program that has been in the state championship talk for the last few season. If the rust has come off, then Mainland should be fine at home against DeLand, but only time will tell the preseason is a bigger sign of things to come. Three brand new public high schools are officially opening this school year with Cypress Creek High School in Wesley Chapel, Windermere High School, and Bonita Springs High School all joining the party in the FHSAA. They will join a handful of new private and charter schools either launching teams or will be joining the FHSAA for the first time. The biggest thing to note is that Cypress Creek and Windermere will hit the ground running quickly as they will open up with a full varsity schedule to start the 2017 season. Cypress Creek faired well in a loss against Fivay in their preseason game. For the Coyotes they open their season this week against at home against Gulf on Friday night. Windermere, however, didn’t fare well at all in a huge loss to West Orange in a game meant to be the starter towards a rivalry, with Windermere taking over half of West Orange’s enrollment zone. With Windermere forced on the road for the first season, they will head over to Cypress Creek (Orlando) to officially start the 2017 season on Friday night. As for Bonita Springs, which does not have a permanent home yet, won’t launch a varsity program until the 2019-20 season when the next FHSAA reclassification comes up. However, the Bull Sharks will build up a program starting with a Freshman-only squad this season, with the introduction of a junior varsity squad for the 2018-19 season as the school adds a grade level each school year. Other programs getting a start this season includes Superior Collegiate in Pinellas County, Miami Christian, IMG Academy’s White team, also referred to as the Varsity team and Four Corners Charter in Osceola County while Miami Community Charter comes back with a program after a one-year hiatus.